The National Anthems of India and Sri Lanka were not played at the beginning of the 2nd ODI between the two countries and it raised quite a few eyebrows. However, it was quickly informed that they will be played only in the first match of each format's series from now on. “We have adopted the practice of singing National Anthem only at the beginning of each format of the game,” confirmed Dinesh Ratnasingham, media manager of Sri Lankan Cricket team. “The practice of singing National Anthem was followed in the first ODI (on Sunday at Dambulla) and again it will be sung at the R Premadasa Stadium, Colombo before the commencement of the only T-20 match (6th September) on this tour. Rest of the venues will have the immediate start of the match without the Anthem Ceremony,” he added. Team India whitewashed their hosts in the Test series and also took a 1-0 lead in the ongoing ODI series after registering a nine-wicket victory over the Islanders in the first match. In the second ODI, Sri Lanka posted a target of 237 for India to chase before rain played spoil sport. India have now been given a target of 231 to chase in 47 overs. National Anthems of the participating countries were earlier played at the beginning of each match, irrespective of their order in the series. 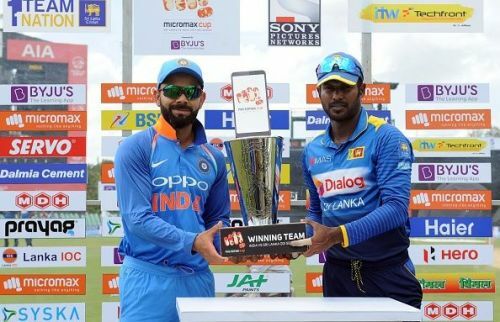 During India's tour to Sri Lanka, the Men in Blue faced their guests in a three-match Test series before locking horns in the five-match ODI series and National Anthems of both the countries were played in all the three matches. However, in the ODI series, the National Anthems were played only in the first match. The spectators will witness the teams sing their National Anthems again on 6th September, before their only T20 encounter. It won't be fair for us to comment on this issue as the decision has already been taken. We hope that it does not hurt anyone's sentiments and spectators welcome the decision. Talking about the series, the Sri Lankan team needs to make a strong comeback as Virat Kohli and his men have constantly dominated the hosts and made all the games seem like a cakewalk till now. The Lankans have to step up to the expectations and give some sort of competition to their guests.